The Friars made it 5 wins in a row behind a fantastic second half team shooting display (64%) and stellar individual performances from Ice Cotton (25 points) and LaDontae Henton (23 points/11 boards). Henton was everywhere on the floor and was even money from long distance, connecting on 3 of 6 from three-point land. Tyler Harris contributed his usual all-around rock solid play and made a couple of hustle plays during the game to both stop a Xavier run and start a Friar one. The real pleasant surprise these last couple of game has been the increased aggressiveness of Carson Desrosiers. 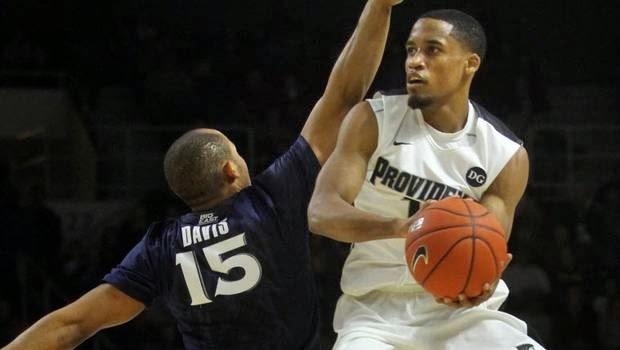 It may not always show up on the stat sheet but he has been playing with a real sense of urgency and seems more sure of himself during the current win streak that the Friars are on. How in the hell is Bryce Cotton not on the final list for the Wooden Award? There was only one player (and deservedly so) from the Big East on the list at all, and that was Doug McDermott. Cotton was 1st team Big East last year when ‘Cuse and Pitt were still in the league. He’s 2nd in the Big East in scoring and 1st in the Big East in assists. I’m OK with most of the people on the finalists list. Some of them, however, make no sense whatsoever to be on the list over Cotton. Two in particular, are not even close to having the same season as Cotton so far this year, and they both happen to play point, just like Ice. Aaron Craft, a player I’ve always liked, must be on this list for one reason, and one reason only, reputation. He’s averaging under 10 points per game AND under 5 assists per game. If you’re not going to score (and 10 points per game ain’t saying much) then you have to be doing something pretty special with assists. You should be close to double digit assists as a point guard if you’re not going to even be in double digit points per game. The second person is Tyler Ennis. His stats are very similar to Craft, but, in addition to Ennis being on the list, there’s another person from his team on the list too, C.J. Fair. Ohio State has been good this year, so to have a representative on the team from OSU makes a little sense…if only a little. Syracuse has been better than OSU but Ennis hasn’t been one of the top 25 players in the country this year if you ask me. The fact that Cotton isn’t on this list over any of the above highlighted players is a crime. Five of PC’s next six games are against the bottom half of the Big East, so this win streak has the chance to really turn into something in the next couple of weeks. Up Next: Thursday at Marquette.